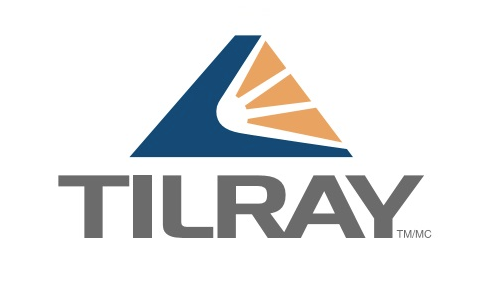 After a hot IPO and first few months of trading, Tilray (TLRY) has come crashing down to $75. Shorts have generally written off the stock due to valuation concerns, but the company has the potential to prove the negative thesis wrong with operations in both Canada and Europe along with some high-profile partnerships. The biggest negative is that Tilray has a market valuation of over $7 billion now after the AB InBev partnership and has only reported yearly revenues to date of $28 million. The bigger picture is that revenue targets for Q4 top $12.8 million and reach $18.0 million in Q1. The Q1 targets have the cannabis stock on a annual runrate of $72.0 million. Despite the fast growth, the amount is still rather small. The 2019 and 2020 analyst views have revenues surging to $133 million and $299 million, respectively. To break the short thesis, Tilray needs to generate actual sales that top analyst estimates. Being a Canadian company, the adult-recreational use market legalized on October 17 is a big catalyst. The company only sold 1,613 kilograms in the last quarter and the expected supply to a province like Quebec will reach 5,000 kg/year. Larger provinces in Ontario and British Columbia should top the demand in the Quebec province. As many of you know, adult-use in Canada began on October 17. We were pleased to launch our products in eight provinces. Based on strong initial consumer demand and constrained inventory across the industry, we are aggressively scaling capacity. The Canadian market got off to a strong start with demand exceeding supply even with the Ontario province not having physical retail stores until next April. The initial revenue surge for Tilray will come from the adult-use market which has the projection of C$2+ billion in 2019 while the medical cannabis market is targeted at only C$1.3 billion by 2024. Even something as minimal as 10% market share in the Canadian market would place Tilray at revenues in excess of $300. The company is expected to be a top 4 producer by 2020 with up 200,000 kg/yr in a market with potential supply expected to reach 3 million kg/yr. 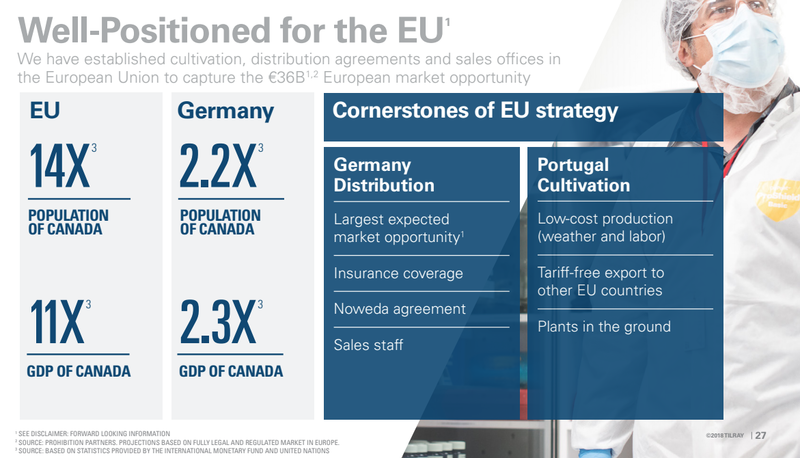 The production facility in Portugal places Tilray in a unique position to serve the European market as it opens up. Logically, Canada is not the ideal location or market to supply the EU. Not to mention, a move into outdoor production should help lower costs. The real question is the ultimate selling price per gram sold. In Q3, bulk sales hit the average net selling price pushing it down to $6.21 per gram compared to $7.53 last September. The shift into the adult-use market should further lower the price as the medical cannabis market should produce the highest prices over time. Even assuming a dip to $5.00 per gram and 200,000 kg produced in 2020, Tilray would generate roughly $1 billion in annual revenues. Naturally, the goal is to watch the cannabis company shift more towards the medical cannabis market as the adult-use market over time could evolve into strictly farming operations that sell a commodity product. The market is only forecasting revenues of ~$300 million in 2020 with a suggestion that Tilray would only sell about 60,000 kg at the $5 per gram level. The upside to the stock price is annual revenues that ramp far ahead of this minimal revenue target. The most immediate number of concern is the $12.8 million revenue target for Q4. The forecasts are only predicting a $2.8 million sequential increase in the quarter with the Canadian adult-use market opening. Only the quarterly amount targeted for the Quebec market (1,250 kgs) would generate ~$7.8 million in additional revenues at the Q3 price per gram. With supply trailing demand, Tilray should’ve seen solid pricing in the quarter. Either way, the upside potential to the estimates appears substantial. The recent deals to form the partnership with AB InBev for cannabis drinks and global expansion of the Novartis’ (NVS) Sandoz co-branded products provide additional upside to those revenue projections. At the very least, these deals legitimize the Tilray platform without diluting existing shareholders via large investments. 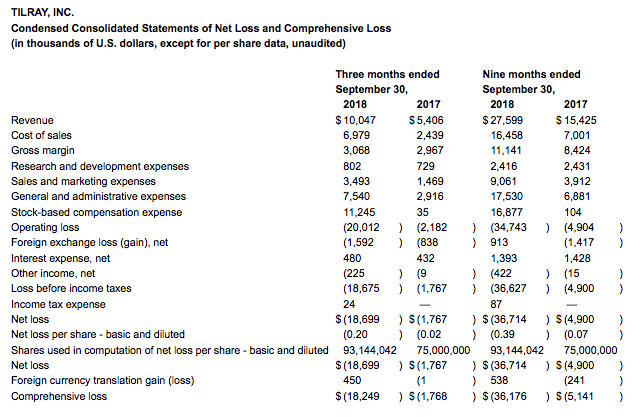 One of the biggest issues brought up by the shorts is the larger losses the company has generated each quarter. The Q3 loss was reported at $18.7 million, up from $1.8 million in the same-period last year. The loss is highly misleading due to a $11.2 million stock-based compensation charge last quarter with the company being public. The adjusted loss was a very minimal $7.5 million. In a similar manner, the adjusted EBITDA loss was only $7.4 million. Both losses were higher than the adjusted amounts from the prior period, but one should easily understand that Tilray was ramping up for the Canadian adult-use market legalization and general capacity growth in Portugal. 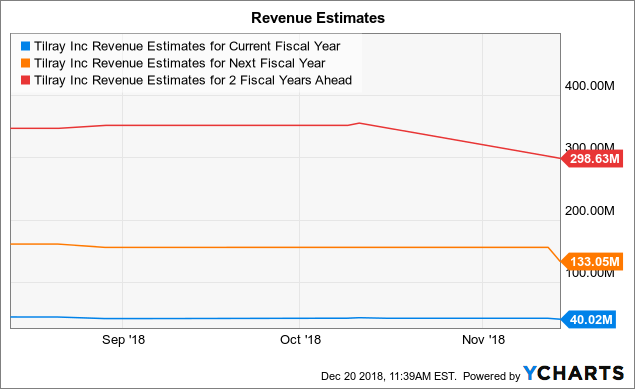 In addition, the company has higher costs from now being a public company that aren’t fully absorbed by a business that is only a tiny faction of the quarterly revenue forecast of nearly $75 million by 2020. In addition, the $11 million SBC charge is rather minimal for a stock valued over $7 billion. The bigger concern is how quickly Tilray can reach quarterly revenues in excess of $100 million. The SBC charge issues will quickly disappear at those levels. The biggest risk in the short term is the 180 day lock-up expiration set for mid-January. On that day about 77 million shares will come onto the market with those shareholders likely to find a stock near $75 now highly appealing following a $17 IPO. The majority of the stock is controlled by Privateer Holdings. The primary shareholders in Privateer include the CEO and a Director of Tilray. The firm owns 16,666,667 shares of Class 1 common stock and 58,333,333 shares of Class 2 stock. An additional 7.8 million shares of Class 2 stock are owned by the previous holders of the Series A preferred stock converted into shares. One would assume that Privateer is unlikely to unload any material amount of shares or the stock of Tilray would collapse. Privateer controls nearly 80% of the outstanding shares with the only real risk being the converted preferred stock. The key investor takeaway is that Tilray should start generating substantial revenue growth that will lead to “real” real revenue streams. In order to slay the bears, the cannabis company needs to exceed current revenue estimates while providing signs that these recent large partnerships can lead to further market expansion and revenue growth. The lock-up expiration could cause some volatility in January prior to Tilray providing key Q4 revenue figures. The stock is very risky at these prices as any execution issues could cut the stock in half. In addition, a flood of supply could crash prices and undercut any bull thesis. For now, the company should be poised to beat revenue estimates. The bears could quickly end up wrong, if revenues reach the $1 billion target in a reasonable period such as by 2021. The market would easily pay over 10x revenues for a $10+ billion market valuation for the stock in that scenario. Disclaimer: The information contained herein is for informational purposes only. Nothing in this article should be taken as a solicitation to purchase or sell securities. Before buying or selling any stock you should do your own research and reach your own conclusion or consult a financial advisor. Investing includes risks, including loss of principal.